Archmere Academy | January 2019: "Learn. Lead. Serve. Succeed." January 2019: "Learn. Lead. Serve. Succeed." Hanh writes that the notion of birth and death are an illusion, in that “there is only a continuation.” We simply manifest in different ways. Hanh quotes the eighteenth-century scientist, Lavoisier and his conservation of mass theory, “Nothing is created, nothing is lost.” This theory was later revised by relativity theory in 1905, leading to the first law of thermodynamics, which states that energy can be transformed from one form to another, but can be neither created nor destroyed. It is true that the impact of our lives reaches beyond our physical presence on earth and we “continue” through our actions, our children, and other ways; however, our Catholic faith is very clear about the existence of the soul. I happened to sit in on a few science classes this fall when the first law of thermodynamics was discussed and thought what a wonderful way to be assured of our belief in the soul and our “continuation” not just in what we leave behind in this life, which is true, but our belief that we are changed, much like everything around us eventually changes. We are celebrating Catholic Schools Week by reflecting on our Catholic Christian faith, our history as a Catholic Norbertine school, and the core values that shape our educational experience – community, reverence, wisdom, respect, and zeal. The National Catholic Education Association has selected a theme of “Learn. Lead. Serve. Succeed.” The action words suggest a life progression that all of us experience. 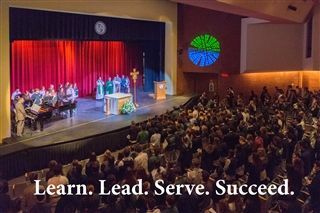 The uniqueness for Archmere students, is that they go through all of these stages in the context of moral and ethical values formed by our Catholic faith and Norbertine heritage. Our lives are like a stone thrown into a pond. The impact of the stone after it is long gone below the surface remains in the ripples that emanate from the stone’s contact with the water. Likewise, our lives are not measured by what we have done chronologically, but by the lasting impacts we have made on the lives of those around us. We see it all around us – the scholarships and grants we are able to offer because of the support from alumni and parents who have experienced Archmere and are grateful, the teacher-to-teacher conversations that take place regularly, so that teachers can share their experiences and skills with each other, and the many community service activities our students manage and complete that clearly have impact on children and families in the community. Our students see and practice “service to others,” making our mission statement’s last line, “empathetic leaders prepared for every good work,” truly lived.